Camp Bijar is located near the historic town of Osor and has won a second place award for ecology and appeal, an award presented by the camping Association of Italy. Both the camping association and the camp's guests have recognized the efforts and investment this little campsite has put into ecological and environmental care. 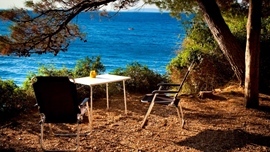 Camp Bijar is a small camp intended for families with children where you will enjoy the peace and quiet of the island of Cres. You can find accommodation in the parcelled or the non-parcelled part of the camp. Choose between 4 plot types available in Camp Bijar. 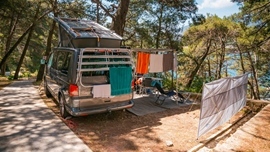 Select a superior pitch if you would like to enjoy a beautiful sea view and have all facilities connections available to you during your stay or a premium pitch a little farther from the sea. Comfort and standard pitches are arranged in cascades in the shade of a thick pine forest, with electricity and/or water connections depending on the plot type. If you do not have your own tent or caravan, Camp Bijar offers you the option of renting a caravan or mobile homes during your stay in the camp. 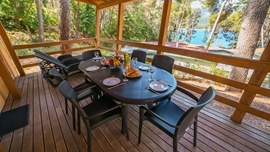 this type of accommodation is fully equipped to provide a pleasant stay and relaxation in natural surroundings. 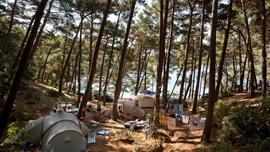 Guests in transit or those who simply choose not to reserve a space in the camp can find an available camping space in the non-parcelled part of the campsite. 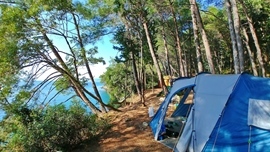 In such cases, they can look for the right camping space themselves or with the help of camp Bijar's staff. 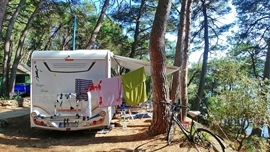 Lovers of the Cres and Lošinj islands and the town of Osor, who are numerous thanks to the wonderful landscapes to be found here, have the option of an annual camping space lease in Camp Bijar.